Warehouse inventory is defined as the articles stocked or stored by a company for business. Maintaining this stock through a perfect management process is of utmost importance. A company’s inventory results in a significant part of the investment and leads to future profits. It is crucial for a smooth business growth. Therefore, inventory management is the foremost duty of a warehouse supervisor. Items may be brought in or shipped out on a day-to-day basis. A little negligence may lead to a consequential loss for a business. This calls for a system which must be developed to organize the stock and maintain a proper record. Various strategies can be implemented to achieve this goal. A warehouse inventory list is usually maintained in order to ensure a well-managed storage. It helps in recording the exact item count. This simple management procedure yields manifold benefits. Apart from serving as a record for the number of stocked articles, this list also helps in locating the required inventory items easily. This is an important function which can speed up the process of shipping out certain products. In addition, it is also useful for regular evaluation of the overall storage capacity of a warehouse. This information plays a crucial role in keeping the inventory well-organized. Items which need to be re-stocked can easily be identified. Likewise, the condition of long term storage products can be assessed from time to time. All of the benefits are a result of a well-maintained warehouse inventory list. A warehouse manager can decide what the contents of an inventory list need to be. In general, it includes the number and nature of goods. Other pieces of information may also serve to be useful. For instance, the duration of storage can help in the maintenance of the stored goods. Similarly, relevant description of the inventory products can be included along with the supervisor’s comments or remarks. This list is updated on a regular basis. It can be designed with the help of an online template. The latter can be customized so that specific requirement can be adjusted. 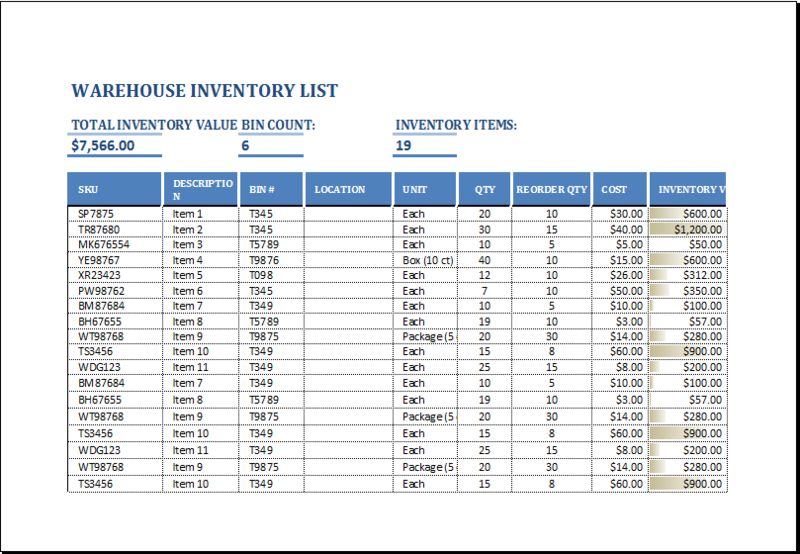 It saves time and leads to a perfectly formatted warehouse inventory list.